The Live Food Factor: The comprehensive guide to the ultimate diet for body, mind, spirit and planet was written by Susan Schenk, an acupuncturist with a Masters degree in Traditional Oriental Medicine. This book, which has been referred to as the encyclopedia of the raw food diet, outlines the theory and practice of eating a diet based on uncooked foods and highlights the variety of benefits that have been associated with this way of eating. Centered around almost seventy scientific studies, Schenk makes a case for the potential of raw foods to promote superior health, mental clarity, emotional balance, optimal weight, beauty, spiritual growth, longevity and ecological balance. The raw food diet generally involves eating plant-based foods that have not been cooked or otherwise exposed to high temperatures. Although some followers of the diet consume raw animal products such as raw fish, meat and eggs, the majority of those eating raw foods adhere to a vegan diet. Schenk explains how cooking food reduces its nutritional value and increases toxic compounds. She also explores nutritional controversies such as vegetarianism vs. meat eating, calorie restriction and food combining. Throughout the Live Food Factor the author attempts to address dieter’s concerns and to answer common questions about the raw food diet. She provides information on how to transition to a raw food diet and identifies common pitfalls to avoid such as not getting enough protein, eating too much fat and not eating enough greens. The book includes chapters on detoxification, fasting, how to manage social situations and raising raw children, as well as a large selection of recipes. Fresh fruit, dried fruit, raw vegetables, sea vegetables, nuts, seeds, avocado, coconut, olives, spirulina, bee pollen, miso, agave nectar, raw honey. The Live Food Factor is primarily about the various aspects of a raw food diet, however for maintaining good health dieters are advised to exercise at least half an hour a day. Walking, yoga and rebounding are recommended forms of exercise. 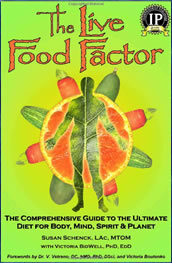 The Live Food Factor: The comprehensive guide to the ultimate diet for body, mind, spirit and planet retails at $29.95. Explains how to avoid protein deficiency. Includes summaries of scientific studies that support a raw food diet. Many dieters have reported an improvement in chronic health problems. Testimonials may inspire dieters to make positive lifestyle changes. Dieters may experience uncomfortable symptoms when first starting the diet. Raw vegan diets can be deficient in certain nutrients including vitamin B12, vitamin D, zinc and selenium. May be difficult to stick to the diet when eating out and in social situations. The Live Food Factor explains the philosophy of a raw food diet and offers practical advice for dieters who wish to embark on a raw food lifestyle. Shenck supports her writing with a large number of research studies that provide compelling evidence of the potential value of this dietary approach. The Live Food Factor Diet will appeal to dieters with a history of chronic illness that has not responded to conventional medical treatment as well as those who are interested in learning more about the history, theory and scientific basis of a raw food diet.